Technology is quickly moving to the forefront as organizations undertake digital and information technology (IT) transformation projects that enable strategic differentiation in a world where users are leveraging applications and data in new ways. The reality is, most organizations were not born digital but instead have legacy business processes, applications, and infrastructure that require modernization and automation. As a result, businesses must embark on IT transformation to modernize and automate their legacy infrastructure and prime themselves to achieve their digital business goals. 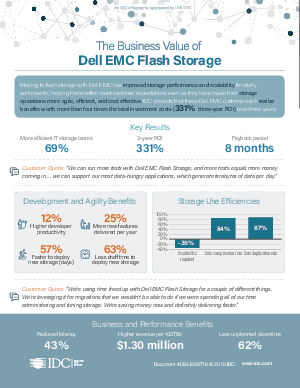 IDC interviewed organizations of various sizes to understand the impact of moving significant parts of their storage environments to Dell EMC solutions, powered by Intel®. Download this report to learn more.